Bimmer has been in daycare almost a year now. It's hard to believe it's been that long since I had the ease of a nanny! Oh, the good ol' days. With daycare now comes the necessity of the teacher gift. Let's bring in Pinterest on this one, shall we? I wanted something super easy (since all my other shopping was already done) and cute at the same time. I wanted something to look a little creative, but without actually having to create it myself. I found the perfect thing when I saw a cute little printable tag! 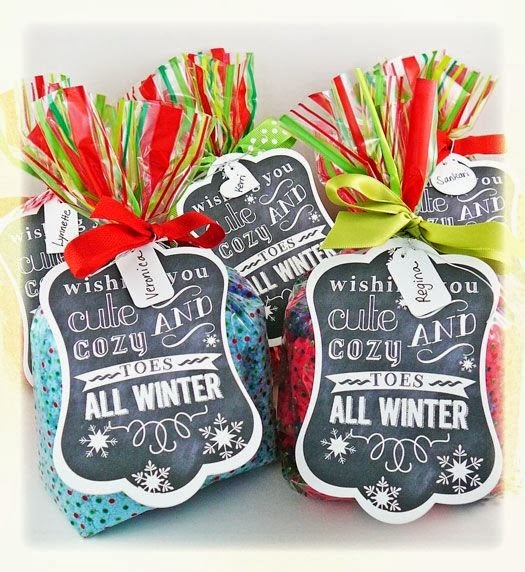 It says "Wishing you cute and cozy toes all winter." 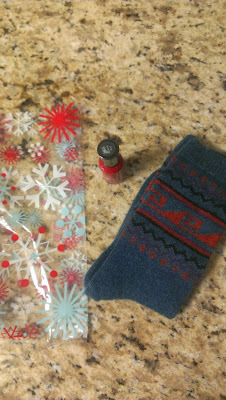 Inside the bag, I put a pair of cozy socks and a bottle of nail polish. Topped off with some ribbon and the tag, and I was all set. I sure home Bimmer knocks this Christmas gift out of the park. I'm already excited to start searching for things to do next year!